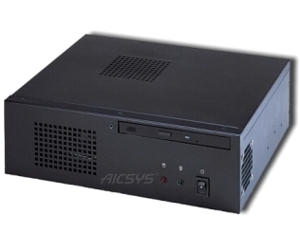 AICSYS Inc. is dedicated provide better and affordable multi-functional box chassis for limited space and cost effective. WMC-103M, a mini-ITX box enclosure with 3 drive bays, expansion by riser card, support Flex ATX power supply. WMC-103M is design to be adaptable and expandable by Riser Card, USB ports by bracket or mobile rack. WMC-103M, the mini-ITX compact chassis is built for multi-application purposes to meet market demand, easy installation and capable to support three drive bays: one external (1) slim ODD bay with the 3 options, and two internal drive bays for (1) 3.5” HDD and (1) 2.5 HDD. 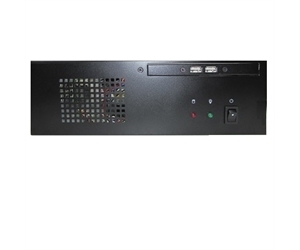 The slim ODD bay could be easily inter-changeable for MC-C1D12, a Mobile Rack for (1)2.5“ SATA Drive, or RCK-USB2P1M-01 for (2) 2.0 USB ports with bracket, or to install (1) slim DVD±RW Drive. WMC-103M also offers the expandability through a (1) slot PCI or PCIe Riser Card and heat dispensation by (1) 50mm fan. All in the compact dimension of 280 x 245 x 89mm (WxDxH). AICSYS Inc. is an IPC hardware manufacturer based in Taiwan. We offer the best industrial computer quality products for wide range of Industrial Rackmount/Wallmount chassis, Backplanes, SBC, LCD & KVM monitor console, Panel PC, power supply and other accessories. AICSYS Inc provide a project solution with our innovative OEM/ODM customization service to meet customers’ specific requirements.